James Fairley’s debut goal helped Whitby Town end their recent woes, as an excellent second-half display banished their 16-game winless run with a 3-1 victory at Workington. The Blues ended an excellent run for their hosts too, who had won 13 of their previous 17, drawing the other four. It wasn't all plain sailing for Chris Hardy’s men, however, having to go in behind at the break thanks to Nathan Waterston’s 25th-minute opener. After half-time, however, the Seasiders rallied, and first club goals for Fairley, Junior Mondal and Lewis Maloney sealed a deserved and much-needed success with a depleted squad. However, the first half, a nip and tuck affair was edged by the in-form hosts, going close on 12 minutes, David Symington curling his 25-yard free-kick just over Ryan Whitley’s crossbar. Whitby did hit back shortly afterwards, Fairley beating Gari Rowntree on the right before cutting back to Mondal, who could only guide his close-range effort over. It was clear that the hosts were looking more comfortable in the awful conditions though and soon took the lead. Symington’s ball through for Waterston raised more than a suspicion of offside for the visitors, though the flag stayed down, leaving the forward to finish low under the onrushing Whitley. The opening 45 minutes, other than the early action, faded into a period of half chances and missed passes, with a heavy, chewed up surface playing a mischievous role in proceedings when it came to moving the ball about. Whitby perhaps struggled to get to grips with that at this point, though after the break made no mistake in taking control of proceedings. Ten minutes after the break, Matty Tymon, playing in an unfamiliar holding midfield role, almost levelled matters, curling Snaith’s ball forward just wide of the upright from twenty yards. It was only a matter of time, though, as Whitby pushed harder for a way back into the game, and it came just four minutes later. A ball forward fell nicely for Fairley, who drove into the penalty area and finished with aplomb past Aaran Taylor to open his account for the club, just a day after signing from Marske United. The hosts were still dangerous, however, Waterston heading just wide from Symington’s cross, before Scott Allison and Waterston again fired chances at Whitley’s goal. The Seasiders held firm in the face of Workington’s play in the final third, and broke out to get their noses in front, 17 minutes from time, just after Mondal almost chipped Taylor after breaking free. Mondal’s next run from deep was picked out, allowing him to go one-on-one. A mixture of a backtracking Matty Douglas and Taylor forced him wide, though it wasn't to faze the young frontman who finished extremely well, sneaking the ball between the near post and the Workington gloveman. Whitby continued to push, and deservedly put daylight between themselves and their hosts just a minute from time. Fairley found himself one-on-one again, though was brought down by Josh Calvert after rounding Taylor, leaving the referee with no choice but to point to the spot. Maloney stepped up from 12 yards, and coolly dispatched the spot-kick into the bottom-left corner, sending the Workington stopper the wrong way. 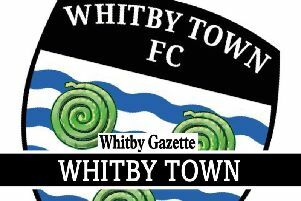 The win is Whitby’s first since September 30th, and their first in 16 matches, allowing manager Hardy a few less sleepless nights than he’ll have had in recent weeks.